Though surrounded by forest, the Veblen House might not exist if not for New York City, where its original owner Jesse Whiton-Stuart was raised and later prospered a century ago selling Manhattan real estate. A recent visit to New York added validation for the cause of saving the Veblen House, in the form of Annie Leibovitz's photography exhibition at the New York Historical Society gallery. You can find many of the photos through an internet search of "Annie Leibovitz Pilgrimage". As the exhibition guide explained, an initial visit to Emily Dickinson's house in Amherst inspired a project that took Leibovitz to homes of many other historic figures, where she photographed objects that had meaning to her. The result is an extraordinary example of how photography allows artifacts located at the various sites to travel, bringing attention not only to the photographer's visual sensibilities but also to the historic figures and locations themselves. The bed of Henry David Thoreau, a dress of Marian Anderson's, the gloves of Abraham Lincoln--items that might gain only passing notice in a museum--are turned into art powerful enough to carry the object's backstory to a new audience. The accompanying text in the exhibition guide offered some parallels with Veblen House. The Veblen's balcony linking the two upstairs bedrooms may once have been used much as Eleanor Roosevelt used her "unheated sleeping porch next to her bedroom, even in cold weather." I thought of Jac Weller, the colorful character, military historian and Veblen neighbor, when reading that Elvis Presley was a collector of guns, one of which he aimed at a television set, now in storage at Graceland. I thought of the Veblen possessions tragically lost to a leaky pipe while in storage at a county building in Trenton, when reading that much of Martha Graham's materials were badly damaged by flooding during Hurricane Sandy. The story of Pete Seeger clearing land along the Hudson to build a log cabin, where he would raise his family (Leibovitz photographed his tool shed), brought memories of Veblen's grandparents forging a series of farmsteads out of the Wisconsin wilderness in the 1800s. Another photo is of Charles Darwin's Sandwalk, a looping path "that he had planted with trees and bushes" and walked along two or three times a day. Veblen, too, planted oaks along a path he would frequently walk. Nature as a stimulant of thought is a recurrent theme among scientists and writers of that era, and in Veblen's motivation to save 500 acres of land, at the Institute for Advanced Study and at Herrontown Woods. Darwin also bred and studied pigeons, which played a role in the life of the first owner of the Veblen House, Jesse Whiton-Stuart. He may have housed them in the dovecote (visible in the first photo in this post) that once stood near the house. Emily Dickinson's love of plants, also photographed by Leibovitz, is a thread that runs through the lives of many others, including Robert Frost and Veblen's uncle Thorstein. A bit of an aside, regarding the connection between wooded pathways and scientists: Growing up next to Yerkes Observatory, I would walk to school along a path used fifty years prior by the astronomer Edwin Frost to get from his home to the observatory. He became blind later in life, but would still walk through the woods to his office every morning. A wire was strung from tree to tree along the path, so he could guide his way with the crook of a cane held against the wire. Pieces of the wire could still be found in the trees when I was exploring around there as a kid. Merging scientists and writers, as Leibovitz does in her exhibit, I somehow turned it in my youthful mind that the Frost who walked that path was Robert Frost, the famous poet. Annie Leibovitz, describing her pilgrimage, says "I couldn't help but be pulled into other people's lives." This website is one more example of that power of people far displaced in time to draw us in. The exhibit runs through February 22, next door to the Natural History Museum. A little searching on the internet yielded the existence of a grandaughter of the first owners of the Veblen House, the Whiton-Stuarts. Their daughter, Sylvia, eloped at an early age with the writer Eric Hatch, and to their brief marriage was born Evelyn Hatch, who was still around until three years ago. If only I had listened to John McPhee, who is said to have said, "You cannot interview the dead. ", we might have learned something of Evelyn and her mother Sylvia, who apparently lived at what is now the Veblen House in the 1930s. HOLMES--Eve (Evelyn) Hatch, of New York City, Cedarhurst, New York and Palm Beach, Florida died at New York Hospital on June 24, 2011 following brief illness. Adored wife of the late E. Williams Homes. Loving stepmother of E. Williams Holmes, Jr., Peter B. Holmes and Jay H. Holmes. Eve was the daughter of novelist and screenwriter Eric Hatch and Sylvia Whiton-Stuart Hatch and cherished granddaughter of Frederick H. Hatch and May Daly Hatch. She had a long and distinguished career in the world of fashion and was for many years fashion editor of Town & Country magazine. Eve was an active member of the Lawrence Beach Club, Rockaway Hunt Club and the Colonial Dames of America. To her galaxy of dear friends worldwide, Eve was especially loved for her loyalty, razor-sharp mind and rollicking wit. She will be missed. Funeral service and burial: Trinity-St. John's Church, 1142 Broadway, Hewlett, New York, Wednesday, June 29, at 11:00am. In lieu of flowers, a contribution to the charity of your choice will be appreciated. Eric Hatch was a writer for the New Yorker, but the following description suggests some interesting connections to recurring themes of the Veblen House and farmstead. One is his service on a State Historical Commission. The other is his passion for horses, which was shared by Sylvia's father Jesse and also apparently by Veblen, who is said to have kept a number of horses on the property. It may be that Sylvia and Eric met in the horse world. More numerical than mathematical, but let it be said: Today is a numerical anomaly, which is to say there is an irregular regularity to today's date, 12/13/14, the last time this century we'll have numbers lined up, unless we count 1/2/34, 2/3/45, etc. May the numerical powers-that-be be with you today. Photos from the 1950s show that the Veblen House grounds used to include a hay barrack (back left). The dove cote in the front right is mentioned briefly in a previous post about the house's first owner, JP Whiton-Stuart. Though the photo here shows the hay barrack being used to store firewood, it may have originally handled any surplus hay the barn could not hold. A barn that once stood behind this hay barrack burned down around 1950. "What I was calling a chicken coop was actually a hay marn, an Acadian form from Vermont (?). Pegs hold up the roof, which can be raised or lowered on four supporting cedar posts, depending on how much hay is stacked inside." Bob and his son Dave used it as a rabbit hutch for growing some 50 Netherland dwarf rabbits. Dave traveled around the region to show the rabbits in contests, and won many trophies. 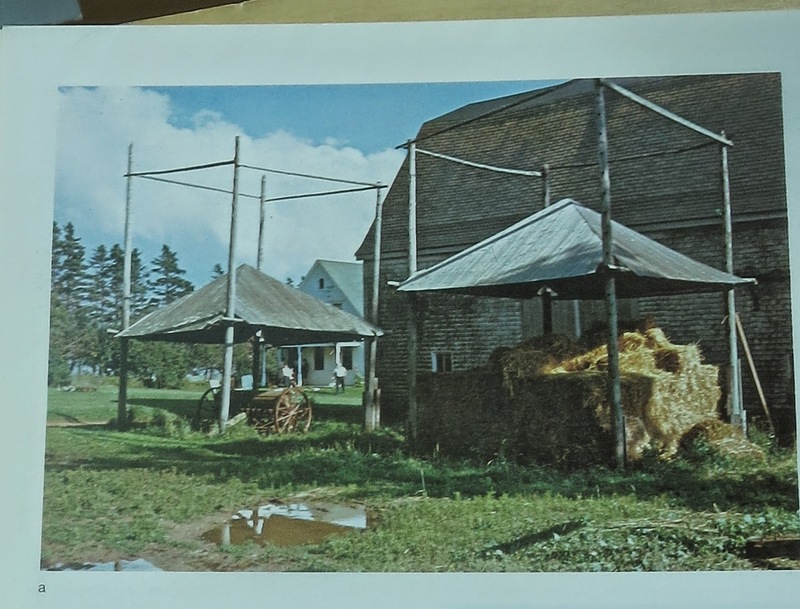 This scene with a slightly different design appears in a book entitled "The Barn", with a description: "This rather oriental-looking scene is actually on Prince Edward Island in Canada. Hay is protected by a hipped roof which can be adjusted up or down depending on the height of the stacked hay. It is a technique to be found on the Magdalen Islands as well as in other parts of the world." "The hay barracks were of Dutch origin, and were exclusively associated with areas of Dutch settlement in America. It was a feature of the traditional Dutch landscape that successfully became established here, but had no appeal to Englishmen, who kept their hay in barns. I am sad to hear that the (Veblen) barrack was taken down in 2008. Was it in such condition that it needed to be taken down? Usually the poles need to be replaced. Hay barracks, once common in the Dutch areas of the State, are extremely rare today. In a fairly hasty canvas of the State, including discussions with several long-time architectural historians, we could collectively come up with only two barracks that could definitely be confirmed as still existing, and they were both on the same farm (in Hunterdon Co., I think). Leads to some others did not pan out, they having been taken down within the prior decade." One aim of our rehab of the Veblen property will be to build a new hay barrack on its original site.